Sacramento County is a county in the U.S. state of California, State of the United States. As of the 2010 census, the population was 1,418,788. Its county seat is Sacramento, which has been the state capital of California since 1854. Sacramento County is the central county of the Greater Sacramento metropolitan area. 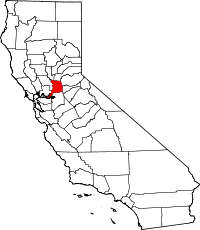 The county covers about 994 square miles (2,570 km2) in the northern portion of the Central Valley, on into Gold Country. Sacramento County extends from the low delta lands between the Sacramento River and San Joaquin River, including Suisun Bay, north to about ten miles (16 km) beyond the State Capitol and east into the foothills of the Sierra Nevada Mountains. The southernmost portion of Sacramento County has direct access to San Francisco Bay. ✪ Sacramento County Jail and Hall of Justice. First Amendment Audit with HDCW and the Sheriff's Dept. Sacramento County was one of the original counties of California, which were created in 1850 at the time of statehood. The county was named after the Sacramento River, which forms its western border. The river was named by Spanish cavalry officer Gabriel Moraga for the Santisimo Sacramento (Most Holy Sacrament), referring to the Catholic Eucharist. Alexander Hamilton Willard, a member of the Lewis and Clark Expedition, is buried in the old Franklin Cemetery. According to the U.S. Census Bureau, the county has a total area of 994 square miles (2,570 km2), of which 965 square miles (2,500 km2) is land and 29 square miles (75 km2) (3.0%) is water. Most of the county is at an elevation close to sea level, with some areas below sea level. The highest point in the county is Carpenter Hill at 828 feet (252 m), in the southeast part of Folsom. Major watercourses in the county include the American River, Sacramento River, Cosumnes River, a tributary of the Mokelumne River, and Dry Creek, a tributary of the Sacramento River. The 2010 United States Census reported that Sacramento County had a population of 1,418,788. The racial makeup of Sacramento County was 815,151 (57.5%) White, 200,228 (15.4%) African American, 14,308 (1.0%) Native American, 203,211 (14.3%) Asian, 13,858 (1.0%) Pacific Islander, 131,691 (9.3%) from other races, and 93,511 (6.6%) from two or more races. Hispanic or Latino of any race were 306,196 persons (21.6%). As of the census of 2000, there were 1,223,499 people, 453,602 households, and 297,562 families residing in the county. The population density was 1,267 people per square mile (489/km2). There were 474,814 housing units at an average density of 492/sq mi (190/km2). The racial makeup of the county was 64.0% White, 10.6% Black or African American, 1.09% Native American, 13.5% Asian, 0.6% Pacific Islander, 7.5% from other races, and 5.8% from two or more races. 19.3% of the population were Hispanic or Latino of any race. 10.2% were of German, 7.0% English, 6.7% Irish and 5.1% American ancestry according to Census 2000. 75.7% spoke only English at home; 10.0% spoke Spanish, 1.5% Hmong, 1.4% Chinese or Mandarin, 1.3% Vietnamese, 1.2% Tagalog and 1.2% Russian. There were 453,602 households out of which 33.7% had children under the age of 18 living with them, 46.4% were married couples living together, 14.1% had a female householder with no husband present, and 34.4% were non-families. 26.7% of all households were made up of individuals and 8.0% had someone living alone who was 65 years of age or older. The average household size was 2.64 and the average family size was 3.24. In the county, the population was spread out with 27.6% under the age of 18, 9.5% from 18 to 24, 31.0% from 25 to 44, 20.9% from 45 to 64, and 11.1% who were 65 years of age or older. The median age was 34 years. For every 100 females, there were 95.9 males. For every 100 females age 18 and over, there were 92.5 males. The median income for a household in the county was $43,816, and the median income for a family was $50,717. Males had a median income of $39,482 versus $31,569 for females. The per capita income for the county was $21,142. About 10.3% of families and 14.1% of the population were below the poverty line, including 20.2% of those under age 18 and 6.6% of those age 65 or over. The Government of Sacramento County is defined and authorized under the California Constitution, California law, and the Charter of the County of Sacramento. Much of the Government of California is in practice the responsibility of county governments such as the Government of Sacramento County, while municipalities such as the city of Sacramento and Folsom provide additional, often non-essential services. It is composed of the elected five-member Board of Supervisors, several other elected offices including the Sheriff, District Attorney, and Assessor, and numerous county departments and entities under the supervision of the County Executive Officer. In addition, several entities of the government of California have jurisdiction conterminous with Sacramento County, such as the Sacramento County Superior Court. The Sacramento County Code is the codified law of Sacramento County in the form of local ordinances passed by the Board of Supervisors. The Sacramento County Sheriff provides court protection, jail management, and coroner service for the entire county. It provides patrol and detective services for the unincorporated areas of the county. Incorporated municipalities within the county that have their own municipal police departments or contract with the Sacramento County sheriff for their policing are: Elk Grove, 170,000, municipal department; Citrus Heights, 88,000, municipal department; Folsom, 78,000, municipal department; Isleton, sheriff contract; Rancho Cordova, 73,000, sheriff contract; Galt, population 26,000, municipal department. Sacramento County was politically competitive in most presidential elections between 1952-2004, but now votes significantly in favor of the Democratic candidates. Candidates from the Democratic Party have carried the county in the past seven presidential elections, and have won a majority of the county's votes thrice during that time (in 2008, 2012 and 2016). The city of Sacramento is strongly Democratic, while rural areas are strongly Republican; suburban areas are more divided. This pattern is also present in congressional and state legislative elections. The last Republican presidential candidate to win a majority in the county was George H.W. Bush in 1988. Conversely, in gubernatorial elections the county often favors Republican candidates, most recently doing so in 2002, 2003 and 2006. In the House of Representatives, all of California's 7th congressional district and portions of its 3rd, 6th, and 9th districts are in the county. In the State Assembly, all of the 7th and 8th districts and parts of the 6th, 9th, and 11th districts are in the county. In the State Senate, parts of the 1st, 3rd, 4th, 6th, and 8th districts are in the county. According to the California Secretary of State, as of October 22, 2012, Sacramento County has 698,899 registered voters, out of 944,243 eligible (74%). Of those, 306,960 (44%) are registered Democrats, 225,688 (32%) are registered Republicans, and 134,677 (19%) have declined to state a political party. Sacramento International Airport is a major, full-service airport with passenger flights. It is owned by the County of Sacramento. The County also owns Sacramento Mather Airport in Rancho Cordova and Sacramento Executive Airport, both of which are general aviation airports. There are also privately owned public use airports located in Elk Grove and Rio Linda. The population ranking of the following table is based on the 2010 census of Sacramento County. ^ "U.S. Decennial Census". United States Census Bureau. Retrieved October 4, 2015. ^ Leip, David. "Dave Leip's Atlas of U.S. Presidential Elections". uselectionatlas.org. Retrieved 2018-09-01. ^ "California's 7th Congressional District - Representatives & District Map". Civic Impulse, LLC. Retrieved March 1, 2013. Wikimedia Commons has media related to Sacramento County, California. Wikisource has the text of an 1879 American Cyclopædia article about Sacramento County, California.